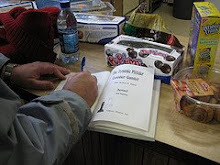 PCG in "Virginia Chess Newsletter"
It has been more than four years* since I last wrote an article on the Philidor Counter Gambit for Virginia Chess Newsletter. Since then, I have had many adventures (and a few misadventures!) with my favorite defense against 1.e4. 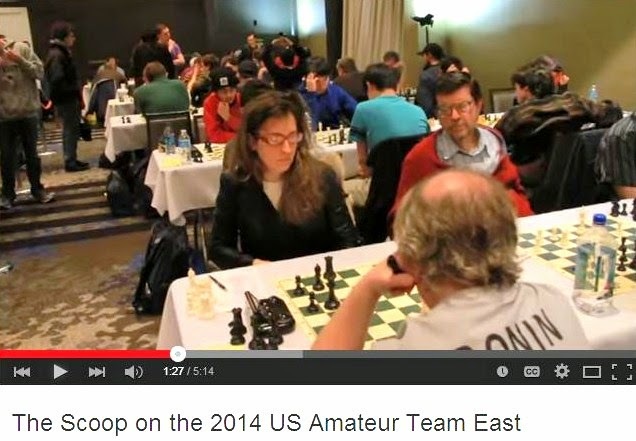 Some of the material in this article has already been published by me in Atlantic Chess News and in Empire Chess. I present it here in a different format, and I have added new material as well. I hope that you enjoy analyzing the games as much as I enjoyed playing them! 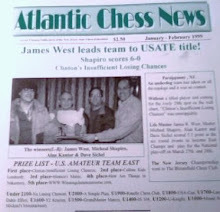 Not long after my last article appeared in VCN, I had what was arguably the best day in the history of the PCG on June 30, 2002, defeating a grandmaster and a player rated FIDE 2280 in my two games as Black in a 4-round tournament at the Marshall Chess Club in New York City. Since I was playing in the one-day schedule, the Ashley game in round one was played at game/30 while the Koenig game in round three had the slower time control of 30/90 followed by game/60. White should have played 15.Rae1 when Black's next move could have been met advantageously by either 16.Bd2 or 16.Rxe5. This move threatens to smash up White's queenside pawns, and if the white knight retreats Black has a good game after 16...e4. This blunder can only be attributed to the fast time control because ordinarily Ashley is an excellent tactician. After this simple capture, White is lost due to 17.Bxe4 Rf4! winning one of the bishops. Now Ashley tries his best to mix things up tactically. 36.Bd1 Bd3 37.Kd4 c5+! 38.Ke3 Bb1 39.c4 bxc4 40.Bxa4 Kg4 41.Be8 Kxg3 42.Bxg6 Kxh4 43.Kf4 e3!, White resigns. To date, this is my only win against a grandmaster! An interesting idea suggested by Peter Tamburro is to transpose into Spielmann-Lasker, St. Petersburg 1909 by 6.Bb5 which would bring about a well-known position in the Vienna Game with colors reversed. The book continuation is 6...exd4 7.Nxd4 Bd7 8.Bxc6 bxc6 9.O-O Nf6 10.Re1+ Be7 11.Qe2 c5 12.Nf3 Bg4 13.Bg5 with clear advantage for White, according to theory. Keep in mind that the colors are switched! Now Lasker recommended 13...Bxf3 14.Qxf3 O-O 15.Qh3 Rf7 16.Nc3 with inescapable pressure after 16...Qf8 17.Re6. But 16...Nd5! solves Black's problems after either 17.Bxe7 Nxe7 18.Qe6 Qc8 or 17.Nxd5 Bxg5 followed by 18...c6. b) 14...Nd4 15.Bb3 Nxb3 16.axb3 O-O. A better move would have been 15.Qh3 when Black has compensation after 15...Qc5 16.Re1+ Ne7 17.Qh4 Rf6 18.Qd4 Qxd4 19.cxd4 Rd8 20.c3 Kf8 due to White's awkwardly placed king. 33.h4 gxh4+ 34.Rxh4 a5 35.f4 Kc6 36.Rh7 Kd6 37.Kf3 a4 38.g4 a3 39.g5 Rb2 40.Rh8 Ke6 41.Re8+ Kf7 42.Ra8 a2 43.Ke4 b5 44.Ra7 Rb4+ 45.Kf5 Ra4 46.Rxc7+ Ke8 47.Ke6 Ra6+, White resigns. The PCG is gaining in popularity as can be seen in the following game played at this year's Polish Championship. 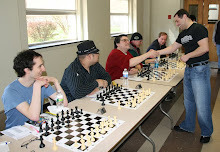 GM Paul Motwani in his book C.O.O.L. Chess likes 6.Neg5 mentioning 6...h6 and 6...e4 but not considering Black's best response 6...exd4 7.Nxd4 Qe7+, as already played by me against NM Dragan Milovanovic in December 2005 at Hamilton NJ, proceeding with 8.Qe2 h6 9.Nge6 Bxe6 10.Nxe6 Kf7 11.Nf4 Qxe2+ 12.Bxe2 Nf6 13.c4 Bb4+ 14.Bd2 Bxd2+ 15.Kxd2 c6 16.cxd5 cxd5 17.Bf3 Nc6 18.Rhd1 Rhd8 19.Ke1 Ne7 20.Rac1 Rd7 21.h4 g5 22.hxg5 hxg5 23.Nd3 Ng6 24.Nc5 Re7+ 25.Kf1 Rd8 26.Rd4 Ne5 27.Rcd1 Nxf3 28.gxf3 Rh8 29.Kg2 Kg6 30.Nd3 b6 31.Nb4 Nh5 32.Nxd5 Re5 33.Kf1 Nf4 34.Nxf4+ gxf4 35.Re4 Rxe4 36.fxe4 f3 37.Ke1 Kg5 38.Rd7 Re8 39.Rxa7 Rxe4+ 40.Kf1 Rc4 41.Kg1 Rg4+ 42.Kf1 Rd4 43.Kg1 Rg4+ 44.Kf1 Rc4 45.Kg1, draw. The real test would have been 11.Nxf8 Qxe2+ 12.Bxe2 Kxf8 13.Bf4 c6 14.O-O Nf6 15.Bd3 Kf7 16.Rfe1 Nbd7 17.Bd6 Rhe8. White has the absolute bishop pair, but Black has no pawn weaknesses. In fact, this position is almost identical to the one arrived at in a game from February 1990 where NM Jerry McDonnell was White against me, reached by this curious move order: 1.e4 e5 2.Nf3 d6 3.d4 f5 4.Nc3 fxe4 5.Ng5 d5 6.dxe5 c6 7.Ncxe4 Qc7 8.Nd6+ Bxd6 9.exd6 Qxd6 10.Bd3 Nf6 11.Qe2+ Qe7 12.Qxe7+ Kxe7 13.O-O h6 14.Re1+ Kf8 15.Ne6+ Bxe6 16.Rxe6 Kf7 17.Re1 Nbd7 18.Bf4 Rhe8. 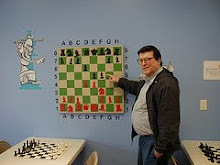 The game was drawn in 52 moves. In August 2005 at Mount Arlington NJ, I tried the wild 8...hxg6 against expert David Grasso. The game continued 9.Qxg6+ Kd7 10.Qf5+ Ke8 11.Qg6+ Kd7 12.Qf5+ Ke8 13.Qe5+ Be6 14.Qxh8 Nd7!? 15.Be2 Ndf6 16.Be3 Qd5 17.O-O Rd8 18.c4 Qf5 19.d5 Rd7! 20.Qh4 when 20...Bd6! 21.f4 Rh7 22.Qg3 Bf7 would have given me good attacking chances as compensation for my slight material deficit. Instead I played 20...Rh7 21.Qg5 Bd6 22.h4 Qxg5 23.Bxg5 Bf5 and held on to draw in 54 moves. It looks like an easy win for White who is way ahead in material. But Black finds a fantastic shot on his 25th move, enabling him to draw. 23...e3 24.fxe3 Nxh4 25.Qb7 Ne4!! Ordinarily double exclams are reserved for winning moves. Here they are given for snaring White's queen. 26.Qxe4 Nf3+ 27.Qxf3 Rxf3 28.Bd5 Rf8 29.Bc6 Rg8 30.R1c2 Bxc6 31.bxc6 Qg4 32.Rd2 Qe4 33.c7 Qb1+ 34.Kh2 Qe1, draw. The final moves could have been 35.c8=Q Qg3+ with perpetual check. In the May 1989 issue of Chess Life, Elie Agur claims in his Fischer Snapshots column that Bobby Fischer made an analytical error in My 60 Memorable Games in the notes to Fischer-Rossolimo, U.S. Championship 1965-1966. The diagrammed position arises in Fischer's notes. Fischer was of the opinion that Black is lost. Agur maintains that "31...Qf3 casts doubts on Fischer's conclusions." After 31...Qf3, Agur gives 32.Bf1 Bc8 33.Bg2 Qg4 34.Qxg4+ fxg4 35.Nf4+ Kf5 36.Nxd5 Rd8, when "Black retains his slight material advantage." d) 33...Qe4 34.Bg2 Qxd4 35.Bxd5! Rg7 36.Qd6+. 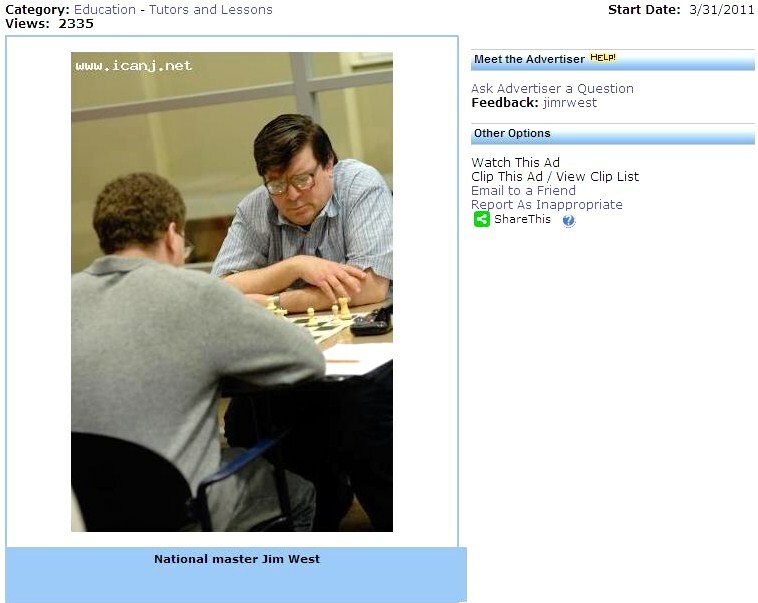 Today I launched a new blog called Jim West Talks Chess at the Chess.com website. 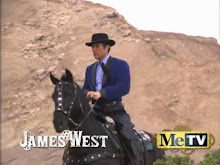 Depending on the response from readers, I may be curtailing the number of posts at Jim West On Chess to concentrate on my new blog. Taimanov evaluates the position as equal. But, in their book Dutch Defense, Christiansen and Silman continue with 20.Qb2! Raf8 (20...Rb8 21.Bxc6!) 21.Qxb7 Bc2 (21...Bc8 22.Qxc6 Rxf2 23.Rxd6 +-) 22.R1d2 c5 23.Rh4 Re8 24.h3 "with a winning advantage." Instead of giving up the b-pawn and being left with a backward d-pawn, Black should play 20...Qf7 in answer to 20.Qb2!. For example, 21.Rxd6 Rxd6 22.Rxd6 Re8 23.h3 Be6 24.Bf1 Bxc4 25.Bxc4 Qxc4 26.Qxb7 Re1+ 27.Kh2 Rh1+! with a draw by perpetual check. My two best games this weekend were Sozin Attacks against a couple of Class A players. 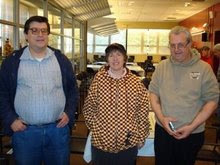 Both took place at the Marshall Chess Club. The time controls were game/60 for the Saturday event, and game/30 for today's tournament. 16.Nh5 Bf6 17.Nxf6+ Kh8 18.Nh5 g6 19.fxg6 hxg6 20.Nf6 Kg7 21.Bh6+, Black resigns. 36.Bd4+ Kf7 37.g6+ Ke6 38.g7+ Kf7 39.Rh8 Rg8 40.Rxg8 Kxg8 41.Kf2 Kf7 42.Kf3 b4 43.axb4 Bxb4 44.Ke4, Black resigns. I should have known better than to get into a debate with Dennis Monokroussos on the Philidor Counter Gambit. At times, it reminded me of the saying that there are three sides to every story: my side, your side, and the truth! I sense that he has grown weary of it, and so have I. The last word in all such arguments goes to the chessboard. I will continue to plead my case in favor of the PCG over the board, not over the blogs. Any future tournament games of mine in this line that are of theoretical interest will be passed on to readers of my blog. So is the PCG playable? I keep playing it! When people ask me what my middle initial stands for, I sometimes say jokingly, "Relentless!" Those of you who have been following my over-the-blogs debate with Dennis Monokroussos can understand why. Every time Monokroussos finds a line that is advantageous for White against the Philidor Counter Gambit, I redouble my efforts to find a better move for Black. This time, my never-say-die approach seems to have paid off because I think that I have finally found an equalizing path in the variation favored by Monokroussos, namely 1.e4 e5 2.Nf3 d6 3.d4 f5 4.Nc3 fxe4 5.Nxe4 d5 6.Neg5 exd4 7.Bb5+ c6 8.Bd3 Bb4+ 9.Bd2. But, first, let me digress. On Marvin Barker's recommendation of 9.c3! ?, I initially gave 9...Qe7+ 10.Kd2 dxc3+ 11.bxc3 Qf6 12.Re1+ Ne7 13.Qc2 Bd6 14.Nxh7 Rxh7!? 15.Bxh7 Kf8 16.Kd1 Bg4 17.Qe2 Nd7 18.Bg5 Bxf3 19.Qxf3 Qxf3+ 20.gxf3 Kf7 21.h4 Rh8 22.Bc2 Nc5 23.Rb1 b5?!. But Monokroussos's 24.a4! favors White because it allows him to trade off his weak a-pawn while opening lines for his queen rook. Instead of 23...b5? !, Black should play 23...b6 with a position where the second player is down a full exchange but has compensation for it in White's shattered pawn formation. Getting back to the position after 9.Bd2, I have discovered that the thematic 9...Qe7+! may equalize for Black although it involves a pawn sacrifice after 10.Kf1 Nf6 11.Bxb4 Qxb4 12.Qe1+ Qxe1+ 13.Rxe1+ Kf8 14.Nxd4 a6! (14...a5!?) 15.c4 h6 16.Nge6+ Bxe6 17.Nxe6+ Kf7 18.cxd5 Nxd5 19.Bc4 b5 20.Bxd5 cxd5 21.Nc7 Ra7 22.Nxd5 Rd8 23.Nc3 b4 24.Ne4 Rc7. In true counter gambit fashion, Black is temporarily down a pawn but has the initiative and is almost guaranteed of regaining the pawn with an equal position. No doubt, Monokroussos will have something to say about all this! 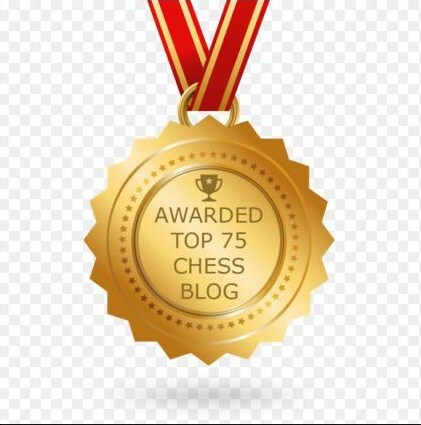 A new website Chess.com just launched. 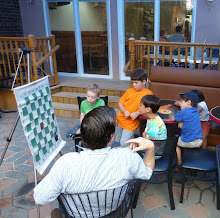 It is "a community site where chess players can come together and learn, share, and play." You might want to check it out! In playing the exchange variation of the Slav Defense, I chose 6.h3 followed by 7.Bg5. I do not see mention of this sequence of moves in my opening reference books. As I encountered a rather comfortable game, I wonder if you can give your opinion of this variation in relation to 6.Bf4, the move often encountered. Readers of this column are familiar with Joe Krasovsky. In the September-October 1990 issue of Atlantic Chess News, I pointed out a win that he missed in a 121-move marathon against a nameless opponent, described only as an unrated "friend". 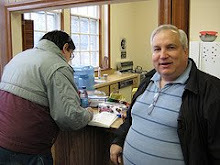 Imagine my astonishment when I encountered Mr. Krasovsky at the Marshall Chess Club last November* and he informed me that his "friend" was none other than the Par Excellence computer, rated USCF 2100! I asked Joe to send me another game and to note the time control, as he has done here with 30/90. The readers can decide for themselves whether my earlier estimate of Class D strength for both players was accurate or not. White should play 8.Rc1, but Black has a good game following 8...h6 9.Bxf6 Qxf6. Or 9.Bh4 g5 10.Bg3 Ne4 11.Bh2 Qa5 12.Qb3 f5. The normal developing move 8.e3 allows 8...Qa5 and 9...Ne4. This retreat loses a tempo, since Black could have played 7...Be7 at once. Instead, 8...Bxc3+ 9.bxc3 Qa5 breaks the pin of the king knight advantageously. For, if now 10.Bxf6?, Black wins a pawn with 10...Qxc3+ 11.Nd2 gxf6. Other 10th moves by White, such as 10.Qc2 or 10.Bd2, can be met b7 10...Ne4. In spite of its mishandling of the opening, the computer would still have a tenable position with 13...a5. Black plays this last move to prevent 19.b6 Qa8 20.Nc5. Had White played an immediate 18.b6 Qa8 19.Nc5, Black would have countered with 19...Rxc5 20.dxc5 Bxa1. The correct recapture is 19...Rxc8 to contest the c-file, although the computer probably wanted to vacate the d7 square for its knight. White's knight had to be kept out of e5, and 21...Nd7 seems the logical way to do it. Now Black must drop material, since 26...Bd8 loses to 27.Rxc8; and 26...Rf7 fails to 27.Nxb6. 26...Bh2+ 27.Kh1 Bd7 28.Rxb6 Qc7 29.Qxc7 Bxc7 30.Rb7 Bxb5? This is desperation, but 30...Rc8 31.Nc5 Be8 32.Nxe6 was just as hopeless. And White won in about 30 more moves. 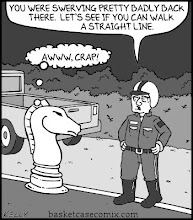 Here, a human opponent would have resigned. The remainder of the game was a complete rout. Here is a game from the November 1987 Toms River quads that you might want to annotate and publish in your column. It is a game replete with mistakes by both sides. The "book" move is 15.Rae1. A better move order is 16...Bg7 17.Rae1 Bf5 18.Qc1 Ng4 19.Nd1 Bxb2 20.Nxb2 Qf6 21.Nd1 Qd4+ 22.Kh1 Bd3, winning a pawn. Now 18...Bf5 can be met by 19.Be4. This is too passive. The correct move is 26.Qd2, maintaining the equilibrium after 26...Qd4 27.Qxa5 Qxe3. Or 33.Rc2? Qd1 34.Rxc4 Qe2+. Not 35.Kf3?? Qh1+ 36.Ke2 Qd1#. No better is 36.Rb2 Qf1+ 37.Kh4 Nf5+ 38.Kg5 f6#. 36...Qd1! 37.Qc3+ Kh7, White resigns. After 38.Ne5, there is 38...Rxe5! with 39...Qg4# to follow.